The lamp pictured here is the first so-called porcelain metal halide lamp to have been successfully manufactured by a company in China. It was first exhibited at the Hong Kong Lighting Fair in October 2002. A broad variety of lamps was shown in ratings of 35, 70, 100 and 150 Watts, and in four different colour temperatures of 2700K, 3500K, 4200K and 6000K. The full range of single and double ended products was shown alongside reflector versions as well. The company was expecting to be able to ship lamps in early 2003 with volumes of around 10,000 pcs per month. The prices mentioned were most attractive, selling for approx GB £7 - roughly half the price of a Philips lamp in Europe. However two years on, the product had still not been released. This is because a few hundred pieces of the raw ceramic for the arc tube were supplied by Philips, who subsequently decided to not to sell ceramic arc tubes for metal halide lamps for strategic reasons. This sample is a 150W 4200K product, however its luminous flux is about 25% less than the equivalent lamp from Philips. There is also no way of telling how quickly this might depreciate during life. Furthermore the colour rendering of this Chinese copy is noticeably inferior to an original Western lamp. 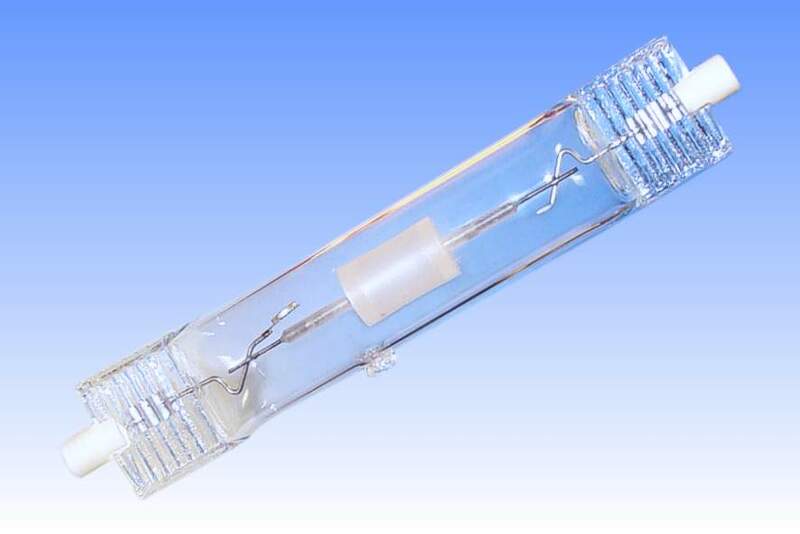 It is suspected that it does not actually take any advantage of the ceramic discharge tube at all - the lamp appears to make use of the same metal halide chemistry as is found in a standard quartz metal halide. Nevertheless, the manufacturer has overcome several challenges in making a sound ceramic-metal seal (even though it infringes Philips' patents). Run Up / Restrike Time 4 minutes 15 minutes max. References: 1) Communication with company president at Hong Kong Lighting Fair, 2002.